The 2018 Winter Olympics have begun! This year’s Olympic Games is being held in PyeongChang, Korea. The city will host Alpine Skiing, Bobsleighing, Cross-Country Skiing, Curling, Figure Skating, Freestyle Skiing, Ice Hockey, Luge, Nordic Combined, Short Track Speed Skating, Skeleton, Ski Jumping, Snowboarding, and Speed Skating. The Olympics are such a fun event to watch on television. One of my favorite parts of the Olympics is the opening and closing ceremonies. So much goes into planning and creating the displays and parades that open and close the festivities. One of the great parts of the opening is the lighting and the running of the Olympic Torch. It travels to the Olympics in such a grand ceremony that it makes an incredible display. Since the torch is such an important part of the opening ceremony we thought it would be fun to let the kids create their own Olympic torch at home. Thank you to Classy Mommy for such a fun and simple craft. 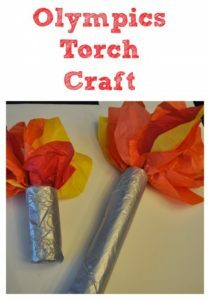 Classy Mommy has a very simple tutorial that will make it easy and fun to build your own Olympic torch at home. So head on over now to follow along. And be sure to check out all the other fun ideas she has for crafts and activities at home. This entry was posted in Activities and tagged Activities, classy mommy, crafts, games, olympic torch, Olympics, the boys store, winter, winter games, winter olympics on February 16, 2018 by Lacy. The Olympics are so much fun to watch. But sometimes you wish you could interact with them. Well we can’t get you a spot on the Olympic team, but we can help you find some fun free printable that will let you create your own medals at home, and help you have some fun during the Summer Olympics. Colleen Padilla has some incredible printable on her website ClassyMommy. You and your kids can create your own medals, color pictures of athletes and events, complete mazes, word searches, and other fun activities while you watch the games this summer. You can learn more about the games and events, and apply some math and science type learning all while playing along with your favorite events and athletes. The Olympics are not only fun they are important for international relationships. It helps to bring together nations of all different beliefs every four years. Use this to help your kids understand the importance of equality, tolerance, and developing relationships by finding as many different flags as you can while watching the Olympics. The winner could earn a fancy new custom medal! 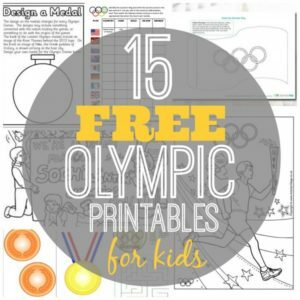 This entry was posted in Activities and tagged Activities, craft, DIY, free printable, Olympics, rio olympics, summer olympics, the boys store on August 16, 2016 by Lacy. People all over the world are watching as Rio de Janeiro hosts the grand event; the summer Olympics. The summer Olympics will show over 11,000 athletes participate in over 306 events. With competitions covering twenty eight different sports. Brazil is a beautiful country and is very proud that their beautiful beach-side city, Rio de Janeiro, is able to host such an illustrious event. Many of you are probably watching the games at home with your family. What do you really know about Rio? We wanted to share some fun facts about Rio. Now you can impress your friends and family with facts about Rio and about the Olympics. Europeans first settled in Guanabara Bay in January of 1502. The Portuguese were the first settlers. They named the area “January River” which was translated Rio de Janeiro. The expedition was led by explorer Gaspar de Lemos as ordered by King Manuel I. At the time Rio de Janeiro was inhabited by the native groups of the Tupi, Puri, Botocudo, and Maxahali peoples. The city of Rio de Janeiro proper was officially founded by the Portuguese on March 1, 1565. First formally named São Sebastião do Rio de Janeiro in honour of St. Sebastian. The saint was the patron of the Portuguese Monarch D. Senastiao. Rio de Janeiro was the official name of Guanabara Bay and during the 18th century Rio was invaded by several French pirates and buccaneers. Jean-François Duclerc and René Duguay-Trouin to name a few. It wasn’t until 1822 that Prince Pedro proclaimed the independence of Brazil. Prince Pedro chose to keep Rio de Janeiro as the capital of his new empire. Rio continued as the capital of Brazil until after 1889, when the monarchy was replaced by a republic. Rio began bidding for the 2016 Olympics in 2007. It is a big deal to be the chosen host city and involves a lot of work in preparation. It takes years to prepare for the 16 day event. Major infrastructure had to be completed, including Olympic Park. The Olympic Village and a lot of urban renovation had to be completed to accommodate all the tourists and participants in the games. The outbreak of the mosquito transmitted Zika Virus caused a lot of controversy. It led to a change in the way health is handled before and during the Olympic games. The Guanabara Bay that is to be used for many water events is heavily polluted. It needs to be properly dealt with before events can be held. This process led to a political upheaval, affecting not only President Rousseff, but also former President Luiz Inácio Lula da Silva. Brazil was also having its worst economic crisis since the 1990s. Which made many question whether the country was prepared for the Games. In May, President Rousseff was stripped of her powers and duties for 180 days following an impeachment vote in the Federal Senate. Leaving Vice President Michel Temerwill as acting president during the Games. This entry was posted in Learning and tagged athletes, brazil, Olympics, rio, rio olympics, sports, the boys store on August 13, 2016 by Lacy.